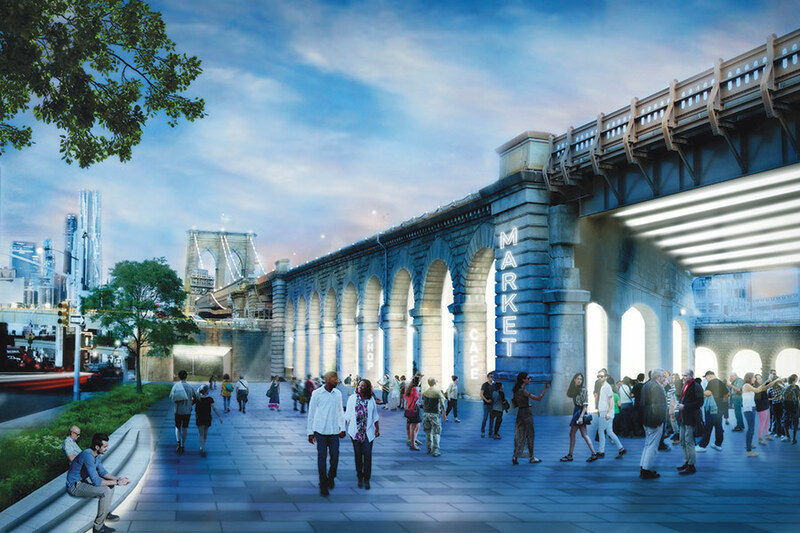 Among the recommendations of the Brooklyn Strand concept is a market beneath the Brooklyn Bridge viaduct. For most of the last century, Downtown Brooklyn’s streets have formed a tangled knot that has confounded urban planners. Urban renewal beginning in the 1930s ripped out vast swaths of the borough’s urban fabric, putting back disconnected parks and plazas. Highway building campaigns tore at the street grid and ramps to the Brooklyn and Manhattan bridges complicate access to and from the waterfront. In the summer of 2014, Mayor Bill de Blasio outlined a series of initiatives aimed at positioning the borough’s civic core as a technology hub called the Brooklyn Tech Triangle. 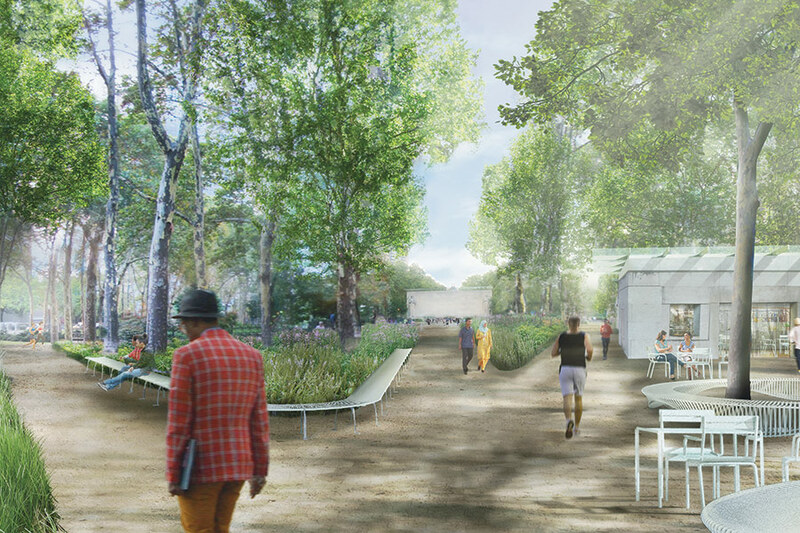 Part of that plan—redeveloping a 21-acre expanse of parkland called the Brooklyn Strand—has come into focus with a new concept plan by WXY Architecture + Urban Design that gives shape to the community’s recommendations from more than 40 stakeholder groups and nearly a year’s worth of public input. A parking lot at Borough Hall would be replaced by a retail pavilion with a park-like green roof (left). Existing structures in Cadman Plaza would be repurposed for education and retail (right). The Strand links together a series of disconnected and underutilized green spaces to form two unified corridors—the Cadman Connector and the BQE Connector—between Downtown Brooklyn and the waterfront in DUMBO, creating safe and visually appealing streetscapes and parks from the heavy-handed planning mistakes of the 20th century. Redesigning streets around Borough Hall would bolster pedestrian and cyclist safety while adding new park space. One idea calls for burying a parking lot to create new park space on the surface. The ground plane rises up to form a retail space with an occupiable roof above. 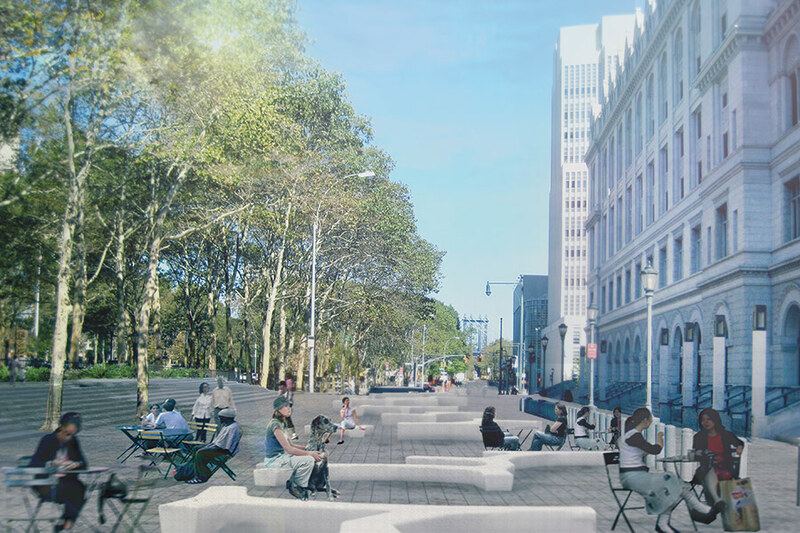 The design pedestrianizes the narrow Cadman Plaza West, bringing in a new streetscape and porous edges to the Korean War Memorial Plaza and the new Brooklyn Public Library designed by Marvel Architects. 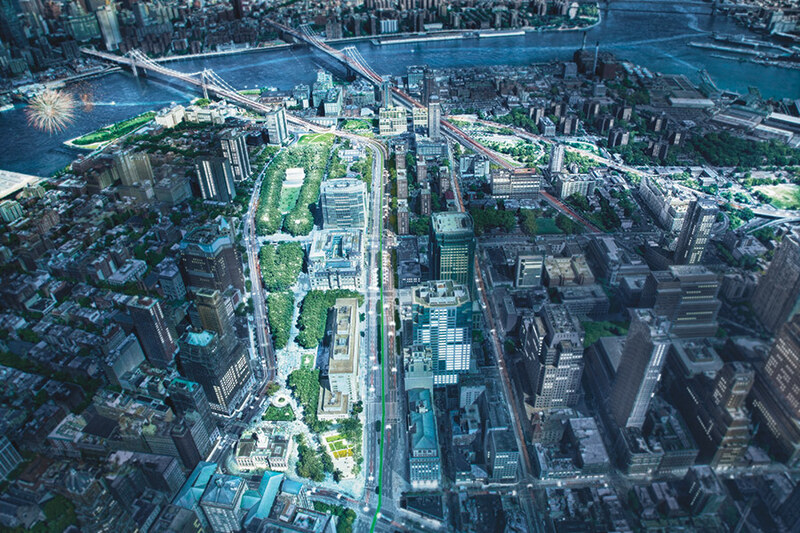 The Brooklyn Strand concept calls for better connectivity between Downtown Brooklyn beginning at Borough Hall and the DUMBO waterfront. 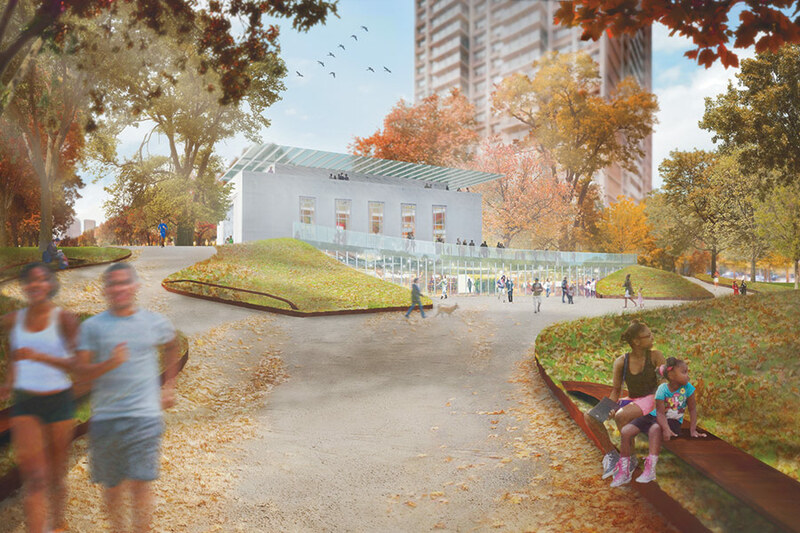 In Cadman Plaza, significant renovations to another War Memorial creates a glassy learning center, overcoming accessibility challenges with a carved out entry plane incorporated into the landscape. At the tip of Cadman Plaza, dramatic earthworks create the “Brooklyn Eye” overlook space with dramatic vistas of the Brooklyn Bridge. 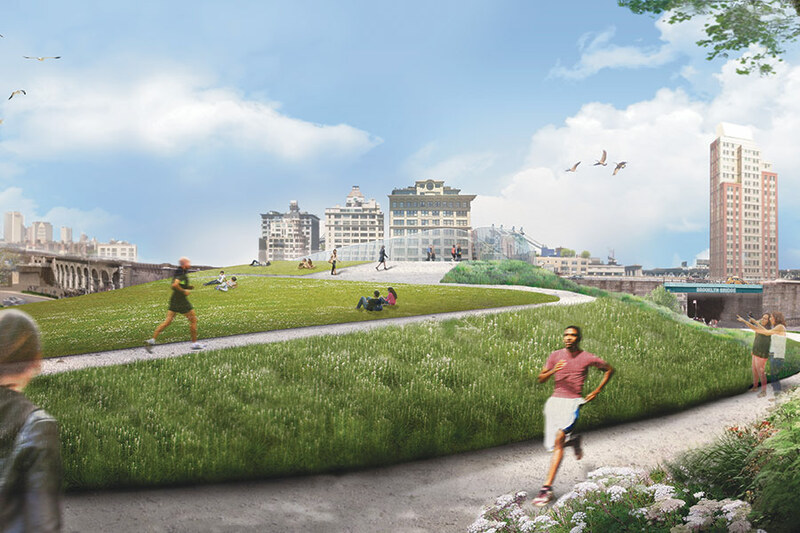 Left to right: The Brooklyn Strand would provide a unified landscape plan for a number of disconnected green spaces; An elevated berm would provide vistas of the Brooklyn Bridge; new streetscapes in Downtown Brooklyn would make the neighborhood more pedestrian friendly. Where the grid erodes at the foot of the bridge, the Strand improves pedestrian flow to and from the waterfront with lighting and new retail at underpasses. A signature open market occupies space beneath the bridge viaduct’s enormous stone archways. These pedestrian corridors weave through small remnant spaces to create a legible path between the bridges. Five major new bike lanes are proposed, including implementing key portions of the Brooklyn Bridge Gateway Area Plan to remake bike lanes along Tillary Street. In April, the plan’s BQE Connector portion will begin a round of community engagement initiatives with arts group Superflex, including public art installations. Before the larger plan can be implemented, however, the Strand must run a gauntlet of approvals from various city agencies and raise significant funds.